The European Parliament has been discussing how to encourage device makers to make their products more durable and easier to repair. Yesterday some recommendations were published which, if enforced, could see devices created with longer useful lifespan. Furthermore, planned obsolescence for physical goods, and software, looks like it is being tackled head-on as it will be defined and then "appropriate dissuasive measures for producers," introduced. Behind these initiatives is a 2014 Eurobarometer survey. The survey found that 77 per cent of EU consumers "would rather repair their goods than buy new ones, but ultimately have to replace or discard them because they are discouraged by the cost of repairs and the level of service provided". an EU-wide definition of 'planned obsolescence' and a system that could test and detect the 'built-in obsolescence' should be introduced, as well as “appropriate dissuasive measures for producers”. In addition to the above new product durability and repairability initiatives, a product labelling scheme was proposed. A voluntary European label should highlight a product's durability, eco-design features, and upgradeability in line with technical progress and reparability. The labelling resolution was passed with an overwhelming majority of 662 votes to 32, with two abstentions. In recent related news the Microsoft Surface Laptop scored a dismal zero out of ten for reparability on the iFixIt site. DCMS select committee report calls for social media firm compulsory code of ethics. Apple won't care, their Ts&Cs and support details are to take it to Apple for all issues. None of it is designed to be a “do it yourself”. Same with Microsoft and the Surface Laptop. It may change things, but not dramatically. They will if they have to comply. Could be the same thing happened with car warranties. 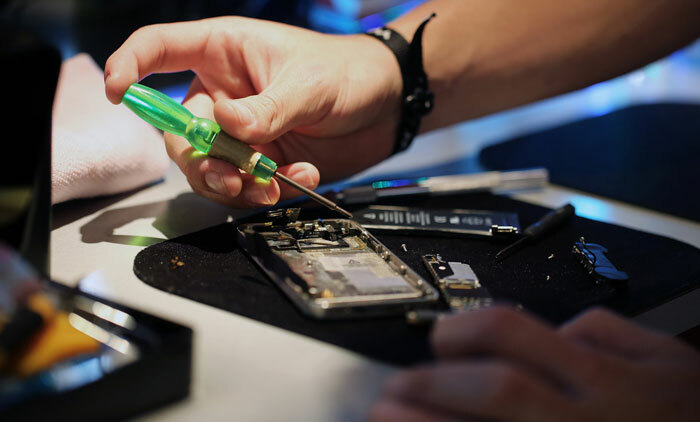 Your local high-street phone repairer could have access to genuine parts for a reasonable price and be able to repair a phone (for example) without affecting the device warranty.